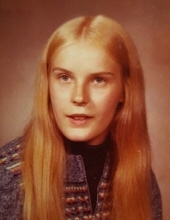 Laurie A. Garner, age 61, of Plymouth passed away on Tuesday, April 2, 2019 at Sharon S. Richardson Community Hospice. She was born in Milwaukee on April 15, 1957 to Bernard and Joanne (Grover) Garner. Laurie attended local schools and graduated from Elkhart Lake High School. Laurie enjoyed making jewelry and had a passion for animals. Laurie is survived by her mother, Joanne; a daughter Elizabeth (Jeffery) Williams; grandchildren, Riley, Layne and Reese; sisters Bernadette (Steve) Cassata and Julie (Tim) McElligott and Bob Brost. Nieces, nephews, other friends and family further survive. Following Laurie’s wishes cremation has taken place and private services will be held. The family would like to personally thank the entire staff at Sharon S. Richardson Community Hospice for the amazing care given to Laurie during her stay. A memorial fund has been established in Laurie’s name. To send flowers or a remembrance gift to the family of Laurie A. Garner, please visit our Tribute Store. "Email Address" would like to share the life celebration of Laurie A. Garner. Click on the "link" to go to share a favorite memory or leave a condolence message for the family.